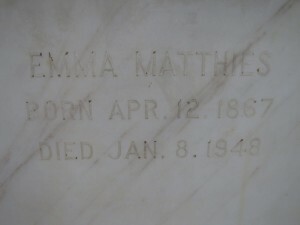 Wife of William Matthies, married November 14, 1885 at St. Paul’s Church, Beecher, IL. Mrs. Emma Matthias, 80, well known citizen of this community, passed away at her home on the Peotone Road, west of Beecher, last Thursday night. Funeral services were conducted at the late residence and following at St. Lucas Ev. and Reformed Church, Monday afternoon. Burial was in the Mausoleum. Rev. G. Horst officiated. 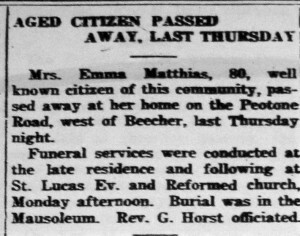 The departed, Mrs. William (Emma) Matthies, nee Huenerberg, the daughter of Henry and Rosina Huenerberg, both deceased, was born, 3 miles west of Beecher, April 12, 1867. The child of Christian parents, she was soon after birth, baptized and later, following a course of thorough religious instruction, confirmed with others in St. Paul’s Ev. Lutheran Church, northwest of Beecher. On Nov. 14, 1885, she was united in holy wedlock with Mr. William Matthies, the ceremony taking place in the aforementioned church, the late Rev. A.H. Brauer officiating. This happy union was blessed with the following children: Alvina (Mrs. Carl Clausing), Beecher; William, Beecher; Ida (Mrs. Ernest Hannover) Beecher; Sophie (Mrs. William Buhr), Beecher; Tillie (Mrs. Otto Jaeger), Detroit; Melinda (Mrs. Martin Oldenburg); Edward, who passed away, Dec. 19, 1941. 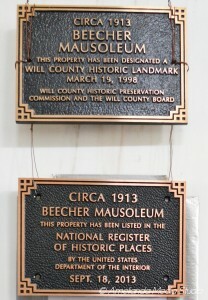 Immediately after their marriage, the young couple engaged in farming – first four years, 3 miles west of Beecher, then four years near Goodenow and since then on the present homestead. Both being deeply interested in farming and faithfully applying themselves to their work their labors were signally blessed by God. Deeply enjoying their life it was granted them to celebrate their Golden Wedding Anniversary in 1935 in the midst of their children and many friends. Two years later, however, Jan 11, 1937, the loving husband and father was peacefully called to his eternal rest. Deeply feeling the loss of a devoted husband, the departed continued on the farm which her son, William, had taken over. Always active, there came a marked let-up due to slowly dwindling strength during the last four months. About two weeks ago, her condition became such that she needed the constant care and attention of her daughter-in-law, Mrs. William Matthies, who together with the other daughters of the departed as well as the husbands, lovingly watched over her until she took her last breath, Thursday Jan. 8, at 6:45 p.m., at the age of 80 years, 8 months and 26 days. She leaves to mourn her passing the children already mentioned, 12 grandchildren, 6 great grandchildren, and one great great grandchild, 2 daughters-in-law, 4 sons-in-law, a sister, Mrs. Minnie Langton, Chicago; a brother, Charles, Hannover, Kansas and a host of other relatives and friends. Funeral services were conducted, Monday, Jan. 12, beginning at 1:30 p.m., at the late residence and continued at St. Luke’s Church where her pastor, Rev. G. Horst, spoke to a large gathering of relatives and friends. Three appropriate songs were rendered by the following: Mrs. Hilda Boysen, Mrs. Vernon Henerberg, Mrs. Mildred Selk and Mrs. Esther Braun. Beautiful floral pieces attested to the esteem in which the departed was held by all who knew her intimately. She was laid to rest in the Mausoleum. The departed, as loving wife and mother, always blessed with the best of health, gave unstintingly of her care, strength and labor to her loved ones. Ever true to her Christian upbringing, she, as a member of St. Luke’s Church, and until recently as a member of its Women’s Guild, seldom missed attending the services and meetings and was always found willing and ready to contribute her share towards the welfare of her church and its larger kingdom work. Thus, following the steady inner light of faith, hope and love, may she now happily realize finding her name written in Heaven in the Book of Life – Luke 10, v 20. Note: You may notice that Emma’s and William’s names are spelled with an “e” in Matthies, and their son Eddie’s name is spelled with an “a” in Matthias. I have found in my research the spelling changes on different documents. I do not know which is correct, or if there was an error made on their headstones. 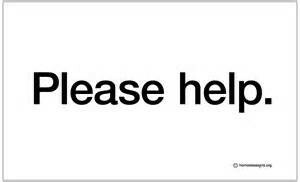 If you can help confirm the correct spelling, please let us know. This entry was posted in Automated Burial Listing, Burial Listing, Burial Location, HEADSTONE, Obituaries- Have Full Copy, St. Luke's UCC - Beecher, St. Luke's Women's Guild, St. Paul's Lutheran Church - Beecher by Sandra. Bookmark the permalink.